BlackWyrm Publishing has relaunched their Kickstarter campaign for their Erasable Fantasy Gaming Maps. 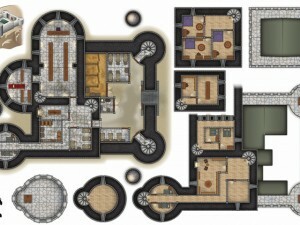 This project will fund the production of two useful, high-quality, and attractive erasable maps for roleplaying games, strategy games, war games, and other tabletop gaming needs: a fantasy castle (49 by 30 inches) and pirate ship (36 by 20 inches). These maps will use one inch squares to indicate distance. Upon completion of this project we will first make these maps available to our backers, and only then to retailers worldwide through distribution and directly to customers through our website. Each of these robust erasable maps will be good for many, many individual gaming sessions! Thus, even though they are more expensive than other sorts of gaming maps, they are in the long run a much better bargain than other similar products, such as single-use disposable paper maps.